According to the Population Census Report 2011, the population of Nepal stands at 26.6 million of which the female population is 51.5%. According to the census 48.5% of the population lives in the Terai (the plains area that runs along our southern border with India), 43% live in hilly region and 6.7% in the high mountain region. The annual population growth rate stands at 1.99% a figure that has reduced significantly from the 1990s, when it was 2.5% per annum. The 2011 census estimates the size of the disabled population at only 514,000 but most experts believe the number to be much higher. The World Health Organisation, for example, estimates the disabled population to be as high as 10% of the total population, or almost 3 million people. Of the total disabled population, physical disability accounts for 36.3%, followed by the blind and partially Sighted (18.5%) and Deaf and Hard of Hearing (15.4%), while those with speech related, mental and psychosocial disabilities rank at 11.5%, 7.5% and 6.5% respectively. The percentage of those both deaf and blind is ranked at 1.8%, followed by the intellectually disability at 2.9% of the total.. It is estimated that the literacy rate of persons with disabilities is only 20%, whereas the general literacy rate is among the Nepali population is 65.9%. The UN’s 2013 Human Development Report ranks Nepal in 157th place in the world, out of (HOW MANY??) countries surveyed, with 44.2% of its population living below the multidimensional poverty line. It is not known what percentage of persons with disabilities live in poverty; however, disability experts claim that more than 90 per cent of disability population fall below poverty line, since persons with disabilities generally do not have access to education, employment, or health care. 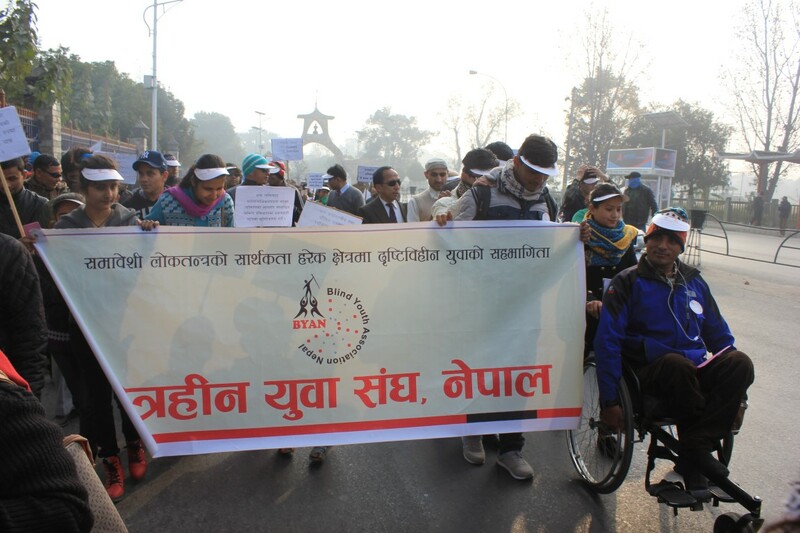 In Nepal, organised form of disability movement started in 1990, when democracy was re-established and new constitution that guaranteed civil liberties and political freedom was enacted. The Nepal Association of the Blind (NAB) was established in 1995 and now has chapters in 44 of Nepal’s 75 districts. More broadly, Nepal’s Disabled People Organisation (DPO) was formed in WHAT YEAR?? The Government of Nepal (GON) initiated services to persons with disabilities in 1981, the UN International Year of Disabled. In 1982 the government enacted the Disabled Persons Protection and Welfare Act, at least in theory endowing certain services in the area of education, training, and employment, treatment. Nepal has ratified several International Human Right Conventions and covenants including the ratification of UNCRPD in December 2009. The CRPD is referred to by both the government and the DPOs in their subsequent work. We do not know the exact number of blind or partially sighted (BPS) Nepalis. However, it is generally estimated that about 1% of the population Nepal falls into this category. (The Population Census Report 2011 listed a total of 94,765 blind persons, but this suspiciously exact number is challenged by the disability movement, including the Blind, since the census process was not disability friendly and cannot be said to fairly represent the exact head counts.) It is estimated that more than 80% BPS person live in the rural areas. 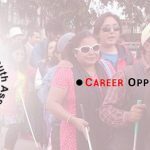 Nepali blind or partially sighted persons have not been fully integrated into the labour market. Most are either unemployed or discouraged from actively seeking job employment. Among those who are working, many are either underemployed, paid below minimum wage, or work below their potential..This has an obvious adverse impact on their lives, as they are unable to earn an adequate living, or to live independently. Employers often resist hiring blind or partially sighted persons, for fear that they will be unable to accomplish the tasks, or that it would be too expensive to hire them. There is a general misunderstanding of disability and of the capabilities of the blind in particular. However, the level of awareness has slowly increased in recent years. On the education front, some blind or partially sighted students have the opportunity to enroll in resource classes near their homes, but the teaching-learning methods and materials are generally not adapted to the needs of BPS. Braille text books are still the main modes of teaching-learning, but by the end of 2015 only 61% of enrolled BPS children were reported to have received such text books. The rest must rely on their classmates to read to them from their text books. The provision of writing assistants to BPS students while taking examinations is also an issue. Since BPS persons are supposed to be included in the normal education system, the existing teaching-learning practices need further adaptation. Training must be given to teachers and the assessment system must be adjusted.. Not surprisingly all of these factors result in low educational performance by BPS students in Nepal. Model United Nation (MUN) workshop for student with Disabilities. Our goal is to Improve the living standards of blind and partially sighted youth by increasing access to blind-friendly education, health and employment services. Please enter your email address below to receive our monthly newsletters and other updates.